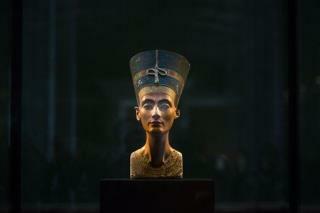 Has Queen Nefertiti's Lost Tomb Been Found? America Used to Have Lots of Llamas. And Now? (Newser) – Tutankhamun's tomb was discovered in 1922. Now, nearly a century later, a University of Arizona archaeologist says that tomb may hold a long-buried secret: the remains of Nefertiti. Nicholas Reeves says he stumbled upon the possibility while analyzing scans posted online in early 2014 by Spanish art-replication experts. The Economist reports they were creating a way for tourists to "visit" the site without damaging it. "Unprecedented" high-def color photos of the walls of Tutankhamun's tomb—given the number KV 62—were released, along with a scans of those walls, whose surfaces were painted to such a degree that the "underlying architecture is almost wholly obscured," writes Reeves. The long-running assumption has been that bedrock lay beneath. But eying them over the course of several months "yielded results which are beyond intriguing," says Reeves. Why does Newser say 'click here for larger picture" then doesn't load it? I know bandwidth is a keeper, but really?! Queen Nefertiti! She was good in those Return of the MUMMY Movies 1999 & 2001! There ya go ALL! Oh, I saw this statue in real life in Berlin when my school went there for a museum day. She is breathtaking. Might have been the first time that art did take my breath away. The next time was in the Lourve and I only had one day and chose the big portrait gallery and yeah, nice. But I walked out and saw Winged Victory on a stair landing. Brought me to my knees cause after five hours of looking at every single thing that should matter? She was the only thing that had dimension and seemed to be alive--like Nefertiti. Who cares about the what's and if's when it comes to art? Art is for your soul.